The good people of Sussex County lay no claim to the fine Pequest River even though its beginnings are in their county. In their county, though, the river is but a dribble, a ditchling, virtually unnoticed by the Sussex folk. Even for those who hop over it everyday on their way to work, or school,--or any place else-it is virtually unnoticed. But when the brooklet reaches Warren County, just a few miles from its source at Stickles Pond, it becomes a respectable body of water. For example, in Sussex County the streamlet is most often referred to as Pequest Crik; in Warren County its name is, without exception, Pequest RIVER. Our river enters Warren County via Allamuchy Township, following the old railroad bed around the village--actually, the river was there first--and the two of them made a good pair until the river entered the swampy Great Meadows. Here, the train couldn't follow; river and train parted company. Then the river entered extremely fertile meadows that, understandably enough, took the name, Great Meadows. Thousands of years ago, after the last glacier, the place was at first a lake, and then a swamp that became a lake again after every rainfall or snowfall. 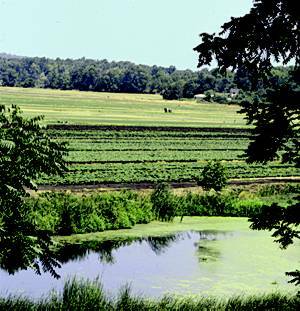 A glacial moraine, a ridge of rock and dirt left by the melting glacier, dammed up the Pequest at present day Vienna and, after rainfalls, caused floods throughout Great Meadows and surrounding areas. Finally, in 1870 the Geological Society of New Jersey hired young geologist, Edward Bowser, to see how this flooding problem could be corrected. Bowser recommended that the river obstructions at Vienna be cut open to prevent damming and the rest of the river through Great Meadows be deepened an additional three to five feet. The same methods should be applied to parts of Bear Creek and Trout Brook, streams that feed into the Pequest. After a long hard struggle the work was completed and the meadows became a farming gold mine. It remains prosperous to this day and will be as long as authorities maintain the drainage as recommended by Ed Bowser. But trout fishing is non-existent in this section of the river. In the 1950s the National Resource Conservation Service rechanneled the river in this area, removing rocks and boulders that provided trout habitat. After more that 40 years this stretch of the Pequest has not recovered. Today the river runs quietly through the meadows that surround it in the Allamuchy area. This section of the river provides a calm but enjoyable trip in canoe with little evidence of the civilization that surrounds it. A canoe trip from Long Bridge Road where it crosses the river in Allamuchy to Route 46, or a mile or so beyond Route 46, makes an interesting, relaxing trip of a couple hours duration. Then calmness leaves the river as it starts its strong drive towards the Delaware. The Pequest, during this last half of its life, moves more rapidly, is rocky and very often too shallow for canoes except during rainy periods. Below Great Meadows the river and Route 46 run side by side almost all the way to Belvidere where the Pequest joins the Delaware. Not too far after the highway and river join they pass through an agricultural area that is becoming residential. On the right hand side of the highway are some cleared fields that were occupied by the Pequest Iron Furnace, one of many furnaces in this area 120 years ago. Workers lived here and worked at the iron furnace, but today, the furnace and company houses have all disappeared. 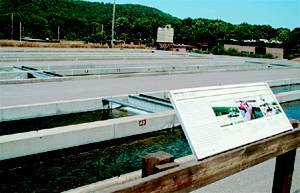 In the same area, in Mansfield and adjoining townships, is the impressive Pequest Trout Hatchery. The buildings for this hatchery exist on both sides of the river and the hatchery now owns almost 4000 acres on which to raise trout. This modern trout farm started producing and stocking trout in 1982 and today stocks, annually, more than 600,000 brook, brown, and rainbow trout. These are stocked in about 200 bodies of water in our state that are open to public fishing. The whole operation is funded by the sale of fishing licenses and trout stamps and money received from excise taxes on fishing equipment. The hatchery is open to the public 7 days a week from 10 AM to 4 PM; it's closed on Christmas and a few other special holidays. 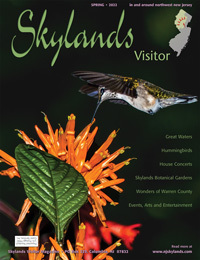 The hatchery people offer extensive programs and films about fish, wildlife, and other natural resources; and evening programs can be arranged. It's a special place in our state that draws good numbers of adults and large numbers of children; both age groups seem fascinated. And it's all free. As an additional bonus, trout fishing here in this part of the Pequest is extraordinary, unlike the upriver section at Great Meadows where trout are non-existent. A few mile drive west of the hatchery on Route 46 comes to an intersection where Route 31 begins and heads due south. For the few people from this area who might wish to visit the state capitol; this is the road to Trenton. The old town at this Warren County intersection, however, is called Buttzville and our river cuts right through the center of the little village. The beginning of a settlement here was a grist mill and a small house in which the miller and family lived. In 1839 the miller sold his house and business to Michael Robert Buttz. Buttz prospered and several subsequent generations of the family lived here and worked here. In anticipation, no doubt, Michael Robert Buttz named this little settlement Buttzville and that is its name today. One still gets the impression of smallness even though a large gas station and repair garage now exist here on Route 46. No members of the Buttz family live here today but several are buried in the local cemetery. River current is strong, anxious to get to the Delaware, and the area has some first rate trout fishing. Local historians attest to two notable fishermen, President Herbert Hoover and baseball's home run king, Babe Ruth, who fished in the Pequest in this area with great success. Another national figure who frequented the little village was inventor Thomas A. Edison who had a manufacturing plant and quarry in the area. Craig's Store in Buttzville was a favorite stop for Edison and he and Tom Craig became good friends. Modern day Buttzville as represented by what a person sees while passing through it on Route 46 is a disappointment. The older village that one can't see from the highway, however, is another thing. As the driver is leaving the center of town going west on Route 46 a difficult-to-notice lane called Mill Street, goes off 46 to the left, down into the river valley. The homes here are the original ones built in the last century, lived in but well-kept; they are simple places--no mansions in Buttzville. The river is crossed by an old country bridge and this little village is a world in itself, a sight that truly reminds you of our rural country of the last century. Don't miss it. Continuing west of Route 46 just a couple of miles is a traffic light and a few stores. A left turn at the light goes a hundred yards to our river and a fine bridge. This village is called... you guessed it; Bridgeville. Back on Route 46 heading westward towards the Delaware our next stop is our last, the County Seat of Warren County, the fine old town of Belvidere. It is here that our Pequest enters the Delaware. Before we get to town, however, Route 46 and the Pequest River part company abruptly. The highway curves right and will come to the Delaware a few miles upriver; the Pequest River makes a sharp left turn, taking the direct line into Belvidere and the Delaware. Just at this turn a rushing mountain stream charges into the Pequest from the right, from the direction of the highlands of Hope. This is Beaver Brook which, indeed, does have its beginning in Hope. In the old days, this brook operated the Moravian grist mill and a saw mill for as long as the Moravians were there and a long time afterward, as well. The Pequest, now with Beaver Brook added, is followed closely into town by an appropriately named thorofare, Water Street. As the river parts company with Route 46 it enters a deep chasm, the deepest on the river. For the length of the chasm Water Street remains high above. Within a quarter of a mile of the village center the river rises to the road level again and enters town still to the left of Water Street, and running parallel to it. Two principal streets are bridged over the river. The first street is Prospect Street. The next street, Market Street, is also bridged over the river. 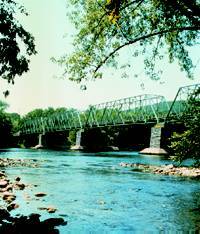 A third bridge that crossed the river closest to its entry into the Delaware is a railroad bridge used in the past by the fabled Bel-Del Railroad. One of the first non-Indian settlers in this area was Major Robert Hoops who, when he came to the area just prior to the Revolutionary War, saw the value of the river's water power. The Pequest falls a full 50 feet in its last mile to the Delaware which made it an important power source in those days. Hoops dammed the river and had several mills and other water power plants along it. He also operated a large slaughter house here during the Revolution here to supply Washington's army. Hoops originally called his little village "Mercer" but later changed the name to "Belvidere". During the Revolutionary War and especially when Washington's troops were stationed in Morris County, Hoops' food shipments, including meat from his slaughter house, prevented starvation of the army and later resulted in some major military victories. During part of the war Hoops served with General Washington as an aide. For the Revolutionary War foodstuffs which he sent to the army he was paid in the currency of the new nation which in the first depression became worthless. Hoops used what money he had to pay his debts and moved to what is today Olean, New York, where he built a cabin home. His wife had passed away earlier in Belvidere and he lived his last years in Olean, alone, and in near poverty. 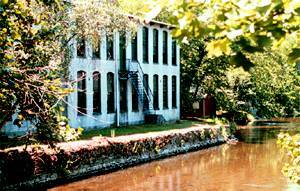 After Hoops, the production of water-powered mills and factories along the Pequest at Belvidere far exceeded the production of the Delaware's power at Belvidere. Even a flouring mill on the banks of the Delaware ran on water piped from the nearby Pequest. The waste water then flowed into the Delaware. In 1825, Belvidere was chosen to be the county seat of new Warren County over Hope and Washington. Land values in the new county capital jumped upward with one corner lot bringing the "extravagant" price of thirty-six hundred dollars. James P. Snell, in his book of Warren County's history published in 1881, wrote of many mills and other water operating plants on the banks of the Pequest that were operating a hundred years after Hoops milling operations. In addition, by the 19th Century the river was surrounded by additional manufacturing operations. Two carriage manufacturing businesses were in existence by the end of the century, one on Prospect Street and the other on Water Street. During this same period both bridges that crossed the river were widened to carry the additional traffic and the Bel-Del Railroad, with its bridge over the Pequest, was bustling. With the nationalization and internationalization of manufacturing, plants have been built closer to the raw materials and large populations, often out of the United States. Belvidere and other old manufacturing towns in the county have faded from state and national prominence. But the best is still with us. Today, our beautiful Pequest River runs through the same hills and valleys that it always did and, in certain areas, the land is unchanged from what it was before industrialization. 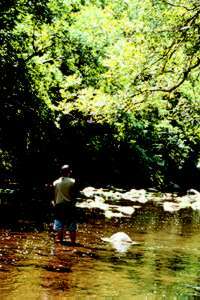 Towns like Allamuchy, Hope, Vienna, and, especially, Belvidere, have much that will recall "the good old days"; and the wonderful Pequest River is better than ever. Frank Dale is a freelance writer and local historian who lives in Allamuchy, Warren County. His book, Delaware Diary, Episodes in the Life of a River, is a chronicle written both from research and his personal experience. Major historical events, little known incidents, and the natural history of the Delaware, among other rivers, make fascinating writing in Dale's hands.